We have a nationwide network of highly trained franchised owner / operators who really care passionately about what they do by providing a transparent service that really adds value to any operator in today’s licensed sector. We have just welcomed our 41st franchisee, committed and signed up to two major shows to end this year as well as 2 further shows signed up for the first quarter of 2019 all focusing on nationwide brand awareness and coverage. There really has never been a better to time to get involved! This really is a golden opportunity with a complete package at only £17,500 plus VAT. You can run your business from home and enjoy benefits such as low overheads, an excellent daily cash flow, high profit margins and massive growth potential. The franchise offers a vital repeat service to your customers, regardless of the state of the economy.Further to this we are now proud to have become members of The Approved Franchise Association, which has adopted the Code of Ethics for Franchising from the European Franchise Federation. Excellent advice and support always readily available. The variety of clients and venues keeps it interesting and fun, I am making a comfortable living as an owner/operator in less than 6 months, and with the size of my territory and the margins available I will be able to grow the business and further increase my income by taking on staff. “Twelve months in and I can certainly say it’s the best decision I have made in terms of work. 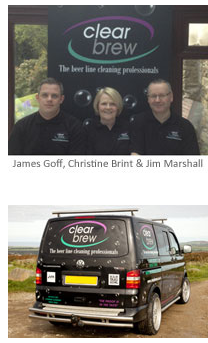 Clear Brew provide a regular and dedicated professional beer line cleaning service. We clean both keg and cask lines providing a fully managed service designed to maintain quality on a regular repeat 3 weekly cycle. Using a specialised water fed mixing unit, coupled with inhibitors, plus market leading chemicals. This service is guaranteed to save our customers money, reduce their waste and improve the quality of their draught products, in turn it will also reduce their risk and maximise yields and add real value, profitability and sustainability to their business. If you would like to find out more about this exciting Franchise Opportunity, please call 01209 703965 or simply fill out the contact form below.